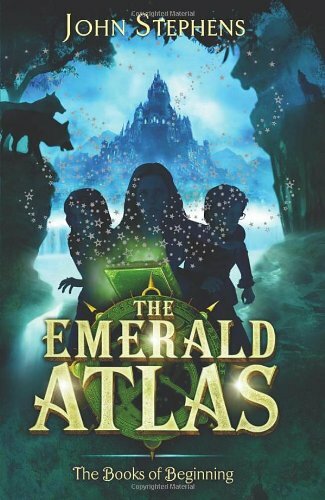 The Emerald Atlas by John Stephens seemed like it would be great from the blurb and the cover, but I didn’t want to get my hopes up. There was no need to worry however, as I thoroughly enjoyed it and believe it to be an extraordinary fantasy adventure that middle-grade children will especially love. It starts off as Kate, a four year old girl, is shaken awake in the middle of the night by her mother who tells her to look after her two younger siblings, Michael and Emma. She also tells her she loves them and that they will all be together again one day. Fast forward ten years and Kate, Michael and Emma are on their way to the latest in a string of orphanages. The orphanage is in the puzzling town of Cambridge Falls and is run by the strange Dr Pym. When the children find a mysterious and magical book, they set off a chain of dangerous events into motion as their time-travelling rewrites the pages of history. The Emerald Atlas was action-packed, suspenseful and humorous. I loved following Kate, Michael and Emma as they went from one danger to another; from finding friends and allies to standoffs with their deadly enemy; The Countess. I felt like I was really there with them because Stephens’ descriptions were so fantastically vivid. I especially loved his descriptions of the creatures in the book as they were eloquent and thus I was able to imagine it clearly. Kate was the one with the most responsibility on her shoulders. She was constantly watching out for her siblings, out of love and in remembrance of the promise she made to her mother. Michael loved reading, learning facts and had an obsession over dwarves. Emma always tried to act the bravest, but she was also the youngest and thus, at times, only had a brave face on. Kate was the main character, but Stephens also showed Michael and Emma’s points of view as they were separated in the story at times. While time-travelling is always a difficult concept to grasp, Stephens did a great job in explaining some of the rules. I would have loved to have learnt more about some of the characters such as Dr Pym, the Dire Magnus and the children’s parents but I will just have to wait until the next book in the trilogy. There is more to these characters than could have been explained in this book alone. I also look forward to developing a deeper emotional bond to Kate, Michael and Emma. Overall, The Emerald Atlas was a wonderful and magical adventure and I can’t wait to read the next book. John Stephens had a lot of fresh ideas that will appeal to fans of fantasy, adventure and action. Those who loved Harry Potter and A Series of Unfortunate Events will also love this. Fab review, thank you Kulsuma! This looks brilliant thank you for the amazing review! Ive had this on my TBR for ages and I really cant wait to read it, it sounds amazing, thanks for the great review! Ahhhhh. Orphans and time travel. Two of my very very favorite things!